Warm weather calls for as much time spent outside as possible, and if we were in any of the following spaces, we’re not sure we’d ever want to go back inside. 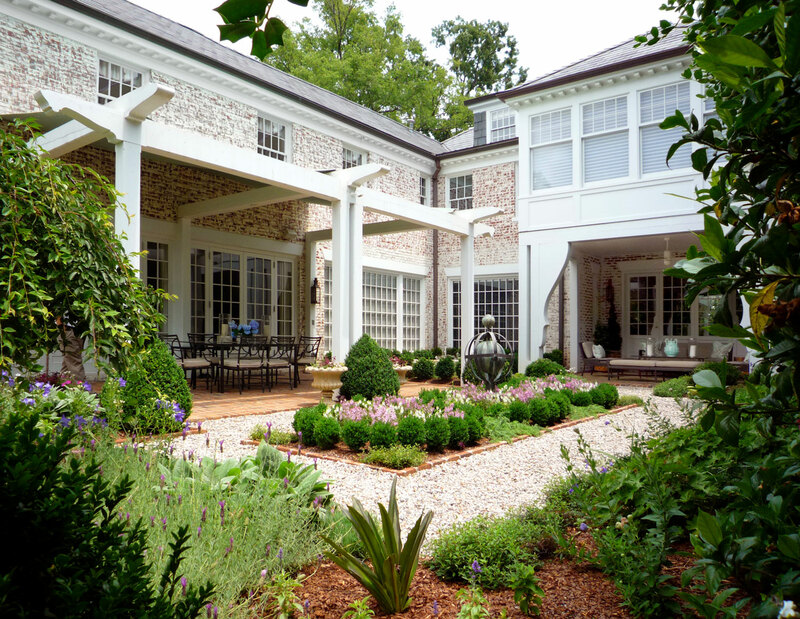 The timeless, elegant porches and outdoor living areas shown below were designed by Pursley Dixon, an architecture and interior design firm based in Charlotte, North Carolina. 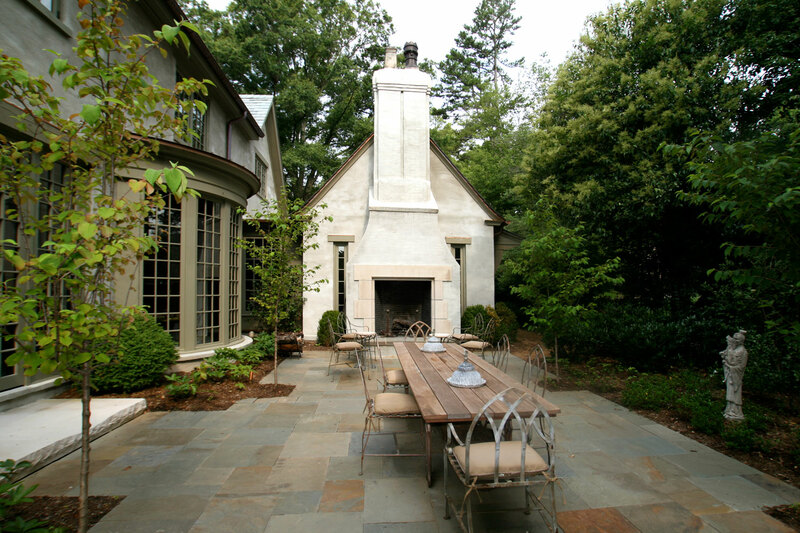 This stunning backyard retreat in Charlotte channels the intimacy of a Charleston courtyard. Architectural details on the home and in the landscape create a tailored, elegant look. Painted timbers on the dining terrace support a canvas awning, while sculptural porch brackets beautifully frame the parterre garden. The covered living and dining areas look out upon an uncovered square filled with beautiful plantings selected by Charleston-based landscape architect Robert Chesnut. In this Charlotte home, Pursley-Dixon designers turned a covered porch into a comfortable, modern retreat. Cool bluestone floors and whitewashed brick walls set a casual tone. Stylish linen chairs from Lee Industries and a custom oversize ottoman are equally suited for dinner parties or lazy afternoons. The designers of this space like to describe the courtyard as “a sophisticated cocktail garden,” and we agree! Completely unseen from the street, this secluded patio is ideal for an evening alfresco. Mingle with cocktails on the terrace, dine at the cottage-chic dining table, and then retire to the intimate sitting area next to a soaring outdoor fireplace. 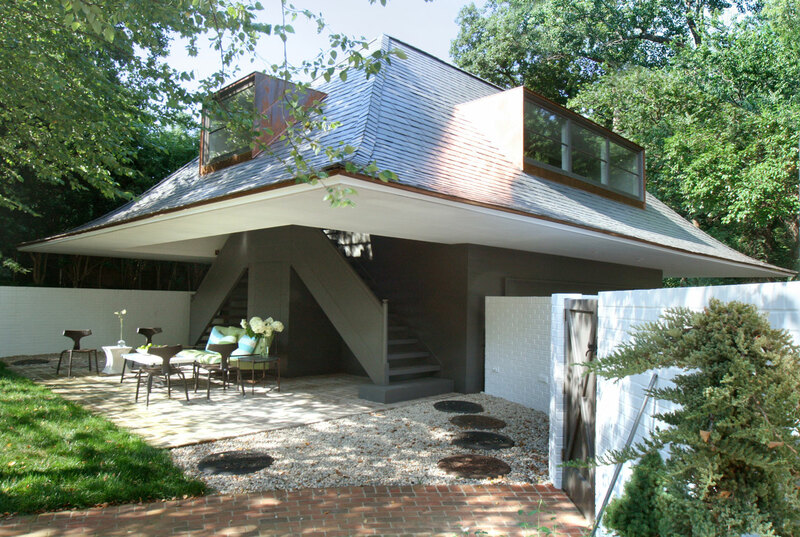 When Charlotte homeowners desired a parking area with living space on top, Pursley Dixon architects created this artful structure with a floating roof. Because there are no vertical supports required to support the roof, there is nothing to obstruct the view from the terrace to the yard and adjacent pool. Shaded by the building’s elegant eaves, a Janus et Cie love seat and chairs provide a respite from the sun. This four season porch is totally dreamy! 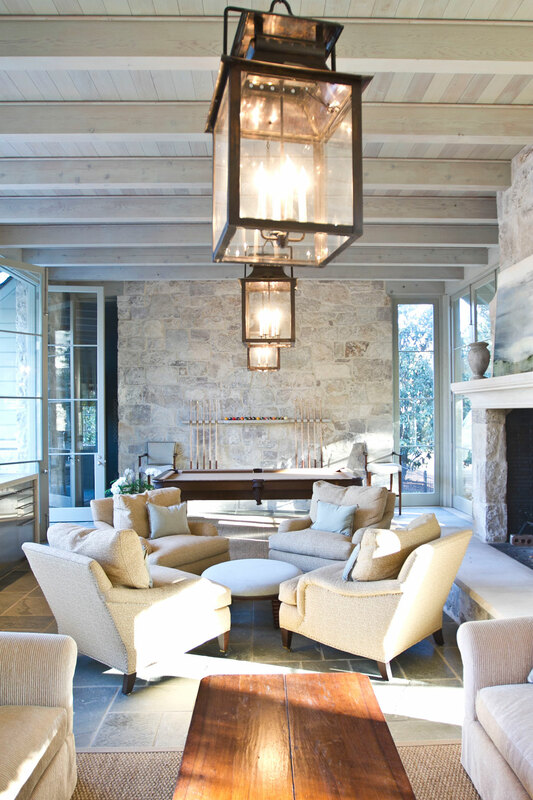 A cream mortar wash on the stone walls and a light finish on the ceiling set a calm, relaxing tone. Folding windows and doors allow seamless indoor-outdoor flow in warmer months, and help contain the heat provided by the fireplace as it gets colder. Large custom lanterns from McLean Lighting provide porch-perfect illumination.